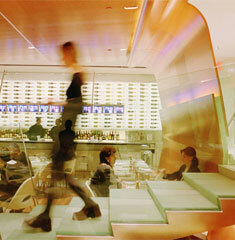 The Brasserie is an incredible restaurant designed by Diller Scofidio + Renfro in the year 2000. 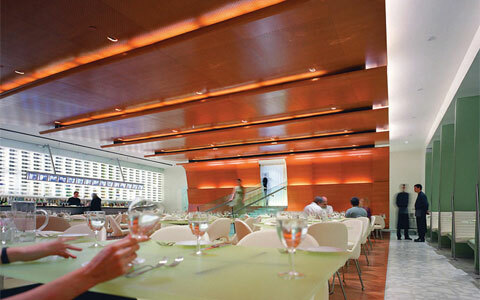 The restaurant is located in the stone base of the Seagram Building, New York, entirely without glass or view. 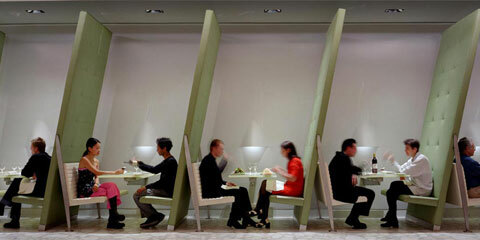 The design emphasizes the social aspects of dining. Entrance from the street is transformed into the ritual of “making an entrance”. 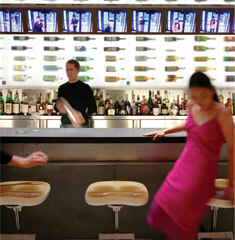 Initially, a sensor in the revolving entry door triggers a video snapshot that is added to a continuously changing display over the bar, announcing every new patron. The descent into the main dining room, several feet below street level, is theatricized with a stair in glass of unusually gradual proportions that prolongs the descent of each new patron and puts him/her on display as they enter the space.